SteelSeries is a Danish company and for more than a decade they are manufacturing gaming gadgets and accessories which include keyboard, mouse, headset, game controllers etc. Their latest addition to gaming gadget is SteelSeries STRATUS a wireless gaming controller for iOS devices which will retail for only $80. STRATUS Wireless gaming controllers feature an innovative flair. It’s a small controller, which can be easily carried. Wireless controller also includes rear covers for extra grip, they come in two colors White and Black. 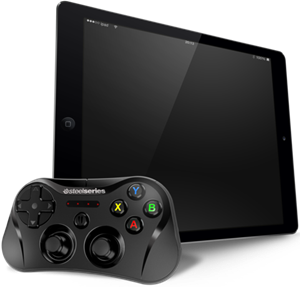 SteelSeries STRATUS wireless gaming controller is compatible with iOS 7 or later plus for the following iOS devices. iPhone 5s , iPhone 5c , iPhone 5 , iPad Mini , iPad Air , iPad 4th Generation and iPod Touch 5th Generation. Wireless controller has 4 Pressure Sensitive Face Buttons, 4 Pressure Sensitive Shoulder Buttons, Dual Analog Stick, 4 Way D-Pad and on/off switch plus pairing buttons. STRATUS use Bluetooth 2.1 for connectivity with iOS devices and 10 hours of rechargeable battery with USB charging. SteelSeries STRATUS Wireless Gaming Controller is up for Pre-order for Only $80 from Steel Series Website. Need to know more about STRATUS Click Here to Visit Official Website.